Illinois-North Carolina tonight! Should be a great game. Since Joannie, Karen, and Mike all went to Illinois, and since it's my home state, I'll be cheering for the Blue and Orange tonight. But more than that, the Illini play an entertaining, beautiful style of team basketball. They move the ball, run set plays, and rarely just run isolation plays for one star. They don't have the individual one-on-one type of offensive talent to do that, so they stay in constant motion. With three really solid guards in their starting rotation (Luther Head, Deron Williams, Dee Brown) they take care of the ball and move it well; a really high percentage of their baskets are assisted. They also play a very solid defense. Fun, fun, fun. When I visited Mike and Joannie in Chicago a few weeks back, Mike took me to some of the Big Ten tournament games. 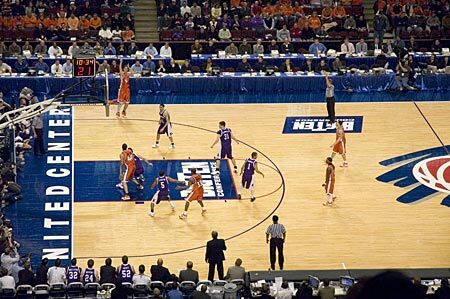 I saw Illinois play firsthand. They weren't at their best then, but they still won without too much bother. On any given night, you can't tell who Illinois' star is. Some games it's Deron Williams (Arizona game). Sometimes it's Head (early in the Big Ten Tournament) or Augustine (late in the Big Ten Tournament). Many times it's Dee Brown, a water bug of a guard (against Wisconsin early in the season, for example). Against Louisville it was the minister, Roger Powell. North Carolina is a tough matchup for the Illini. The Tar Heels have the individual talent to play man defense against Illinois, whereas teams like Arizona and even Louisville had to play a zone. Illinois kills zones with their ball rotation and three point shooting, and it's so hard to track them in a zone because of their motion. The Tar Heels have more individual talent than any team in the country in the top seven of their rotation, and May is a beast. The early line has Carolina favored by 2.5 points, and that sounds about right. Last weekend, Jason and I watched from my living room as Illinois staged an awesome comeback against Arizona. Tonight, I'll still be watching from my living room, while Jason will be in the fifteenth row in St. Louis. That sounds about right, too. Footnote: I'm old enough to remember cheering on the last Illini team to make the Final Four, the 1989 team that included Kendall Gill, Nick Anderson, Stephen Bardo, Kenny Battle, and Lowell Hamilton, the team that got shot out of the semifinals by Glen Rice and Michigan. So I'm one of those people old enough to have experience on my side in the "who's better, the 89 or 04 Illini" debate. But I won't weigh in, because I can't get over how that dates me.